Last Thursday night, fellow bloggers and fashionistas Lisa, Cara-Mia, Cindy, Corinne and I hit the town for Girls Night Out. We started our night with happy hour at the new hot spot Bang Bang (where I ate the "Ryan Gosling" roll- yum!) 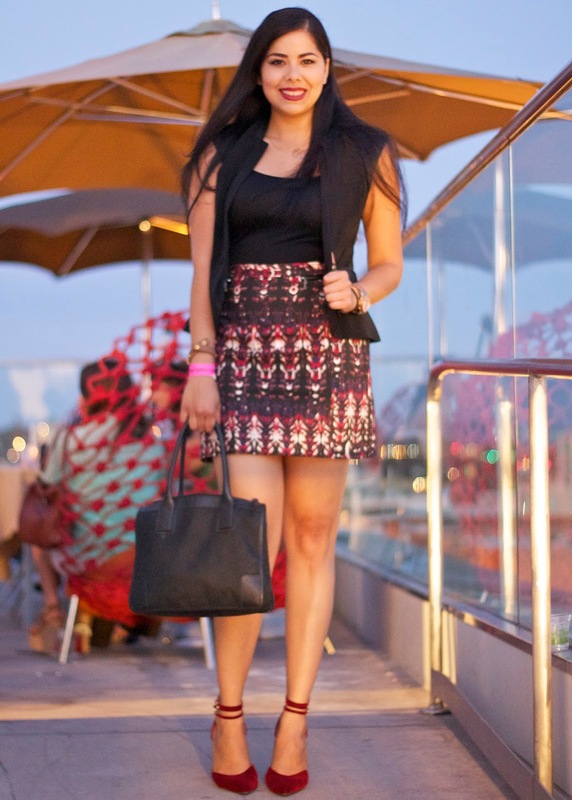 and then walked on over to the beautiful Andaz rooftop for the official Sassy City Chicks party. The Andaz rooftop is perfect for pictures with the view of downtown San Diego and their chic decor surrounding us from every angle. We were welcomed with drink tickets, a chance to win a Kate Spade purse (which sadly I didn't win) and many vendors with cool products. Among the vendors Dama who sells purses, jewelry and explained to me their new venture- re-purposing vintage jewelry by using it for new statement creations (pictured below). We saw the manicurists and make up artists in action as they pampered guests and got into the fun with some photobooth action. It was also cool bumping into friends and chatting with fellow blogger Lea from High Heeled Style who I hadn't seen in a while. All in all, girls night out was so much fun, as I love my girl time- it's essential! and i love your new banner! This seems like a great event. Also I love your outfit, specially those shoes, vest, and skirt. You look amazing as usual. Looks like you ladies had a great time. You look beautiful! Oh you ladies did have a perfect GNO! You looked so fabulous Pau, the skirt is so much fun, love how the vest adds the perfect chic touch on top! Love the skirt and your lip color.